No Buttocks Crack At The Grammys! 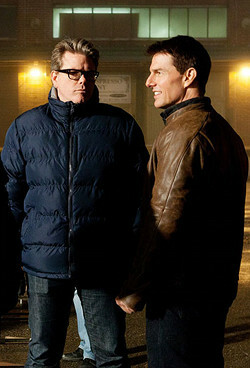 Director Christopher McQuarrie Reachering Around MISSION: IMPOSSIBLE 5? Tom Cruise did some of the finset work of his career in 2012. Rock of Ages and Jack Reacher presented a performer who still has something to prove. Post M:I-3 meltdown notwithstanding, the past few years have found Cruise more apt to venture into more assorted fare. After Oblivion he’ll be appearing in All You Need is Kill, a movie that sells itself on title alone. He followed that up by clarifying “deciding to accept” isn’t the same thing as “decided to accept.” No matter, he’s since deleted the exchange. Listen, I could watch Brad Bird direct Mission: Impossible entries from here to eternity, but Cruise has seemed adamant regarding his directors as one-offs. Strangely, 3 and Ghost Protocol are the only two films in the franchise that maintain any sort of tonal and narrative continuity, as De Palma and Woo’s efforts couldn’t have been more unrecognizable from each other. All that said, I love McQuarrie for this. And it’s encouraging to hear he probably won’t wait over a decade to get in a director’s chair again, as he did after Way of the Gun (writing credits include Usual Suspects, Reacher, the aforementioned Kill, and the upcoming Wolverine). Reacher proved McQuarrie could really push the limits of a hard-nosed PG-13 rating, more so than perhaps any other film with that rating. It’s not a done deal, but a McQuarrie-directed Mission: Impossible would be a very fine thing indeed.